Read between the lines of a familiar fairytale and you may stumble across a rabbit hole you never noticed before. Those curious enough to follow their ears into the black will be met with a world of escapism, narrated by the weird and wonderful music of Alice’s Night Circus. Ringmaster Julia Scott orchestrates the magnificent sounds of Alice’s Night Circus. Juggling a smorgasbord of influences with a pop sensibility, the Sheffield-born artist walks the tightrope between her theatrical world and the mainstream sound-du-jour. Eccentric single ‘Curious World’ is the ultimate demonstration of this: what begins as an off-kilter waltz that harbours her eccentricities eventually bursts into a grandiose chorus, showcasing her earworm hooks. 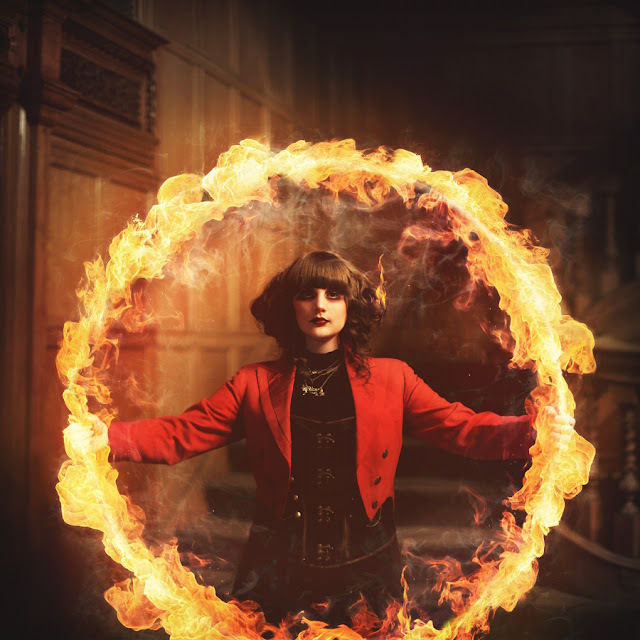 The main attraction of Alice’s Night Circus is undoubtedly her staggering vocals, which have evoked favourable comparisons with powerhouse vocalists such as Florence and the Machine and Shirley Bassey. The classical training she received whilst growing up has informed both her singing and her music, which bears traces of opera, musicals, jazz and symphonic metal. But, perhaps her biggest influence has been drawn from the world of Steampunk. She made her debut live appearance under the Alice pseudonym at the world’s largest and longest running Steampunk festival called The Asylum in Lincoln, where she now resides. Having taken inspiration from the awe-inspiring visuals and beguiling theatrics of the community, Julia begun to create her own costumes and accessories for live shows and Steampunk events. Furthermore, she’ll appear as herself and Alice as part of Gary Nicholls’ Imaginarium trilogy, a photography project centred around Steampunks. Like Panic! At The Disco who married debauchery and cabaret with pop prowess, and Muse who converted a fascination for space into cabinets of album awards, Julia is attempting to lure the mainstream into her conceptual world of circus and theatrics. With an abundance of tricks up her sleeve, we have every reason to believe the ringmaster can draw a crowd to Alice’s Night Circus. Alice's Night Circus - Curious World Now available as a free download here: http://www.dmfdigital.com/releases/vi... For those of you wondering there is more on the way! Website: http://www.alicesnightcircus Facebook: https://www.facebook.com/alicesnightc... Twitter: https://twitter.com/anightcircus On a cold April morning, The clock strikes thirteen, One thousand and one shades of grey. Follow the leader and drink down a cup of compliance, But I don’t need your thought control, I’ve got my own brave new world! Don’t be afraid of the dark, It’s just a place for your mind to wander, Far away far away Come back another day, oh. Don’t be afraid of your heart, It’s more than the sum of its parts so, Follow me, Far away, far away, Curious, Curious World. Untold curiosities, Wheels within wheels, Wonderful realm of macabre. Welcome to my love affair With the strange yet familiar, Embrace the eccentricity, A sweet but twisted symphony! Don’t be afraid of the dark, It’s just a place for your mind to wander, Far away far away Come back another day, oh. Don’t be afraid of your heart, It’s more than the sum of its parts so, Follow me, Far away, far away, Curious, Curious World. Untold curiosities, Wheels within wheels, Wonderful realm of macabre. Take off your pinstripes Your costume awaits at the door, Just free your mind and explore! Don’t be afraid of the dark, etc.